I love coconut, and I love cookies… and I’ve been dreaming of creating these Coconut Cut Out Cookies for quite some time! 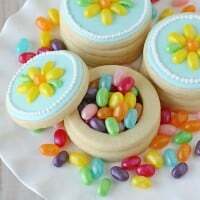 These cookies are quite delicious as is, but they are the perfect canvas for decorating as well! 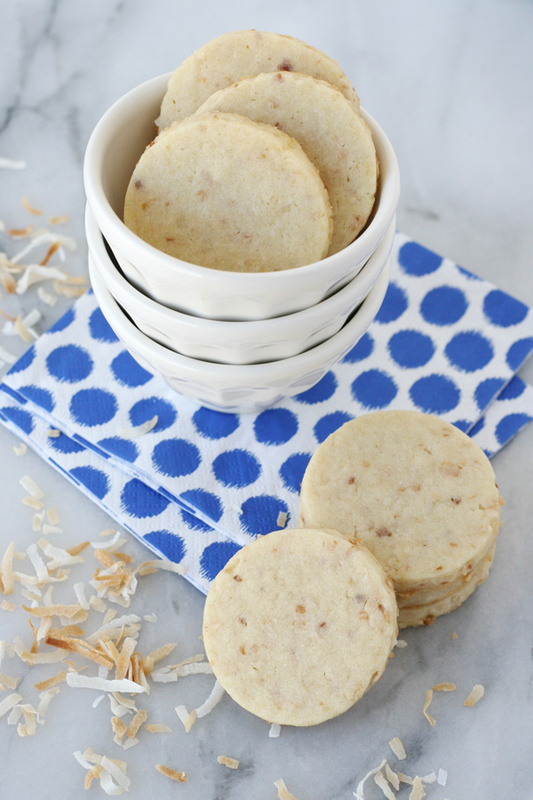 Wouldn’t these coconut cookies be the perfect base for some fun summer or luau party cookies? As much as I love my basic sugar cookie recipe for decorated cookies, this coconut version is my new favorite! 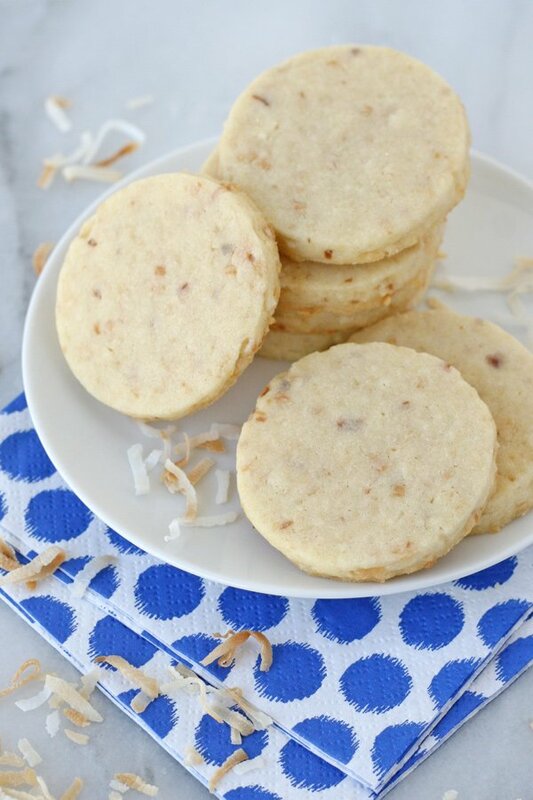 These coconut cut out cookies are rich, buttery, chewy and flavorful! I opted for toasted coconut in this recipe and it adds just the perfect rich and nutty flavor! You’ll notice, the toasted coconut also adds little flecks of brown to the cookies. Although I did create these cookies to be used as a base for decorated cookies, I would recommend choosing simpler shapes for this dough (circles, hearts, etc.). Because of the added texture from the coconut, more intricate shapes make not cut perfectly, as there may be a few pieces of coconut that create a bit of an imperfect edge. If the bit of “character” on the edges bothers you, feel free to use a food processor to pulverize the coconut a bit more than I did. These coconut cookies are rich, flavorful and delicious! Feel free to enjoy them as is, drizzle with a bit of chocolate, or decorate with royal icing. Spread 1 and 1/2 to 2 cups sweetened, shredded coconut onto a baking sheet. You want to end up with 1 cup of finely chopped (processed in the food processor) coconut, so you need to start with more than that. Bake coconut in a pre-heated 350*F oven for 3-7 minutes. Check after 2 minutes, then check and stir around every minute or so after. The coconut can burn VERY quickly, so watch it closely. The coconut is done when it is golden brown and fragrant. Set aside to cool. In a large bowl, add flour and baking powder. Whisk gently, then set aside. In the bowl of an electric mixer, beat butter until smooth. Add sugar and blend until well combined. While slowly blending, add egg and both extracts. Blend until combined and then stop mixer and scrape down the side of the bowl. Place cooled coconut into a food processor and process until the coconut is no larger than 1/4" in length. The smaller the coconut pieces, the easier it will be to cut more intricate shapes, but also you'll loose some of the nice chewy texture that the coconut adds, so process as much or as little as you like. Add processed coconut to the bowl of flour, and stir together. Start the electric mixer back on low, and slowly pour the flour/coconut mixture into the bowl. Blend until fully combined and the dough starts pulling away from the sides of the bowl. Dump the dough into the bowl the flour was in, and scrape out any little bits of dough (into the flour bowl). Grab about half of the dough and form into a large ball (kneed by hand just a bit if needed) and put dough into a large ziplock bag (or wrap in plastic wrap). Repeat with the other half of the dough. Flatted the (wrapped) balls of dough just a bit, and put the two flatted disks of dough in the fridge for 15-30 minutes until firm. Roll out the chilled dough on a lightly floured work surface, or between two sheets of parchment paper or plastic wrap. Roll to about 1/4"-1/3" thick and cut into desired shapes. Add cookie shapes to a baking sheet lined with parchment paper or a Silpat liner and once you've filled the baking sheet (leaving about 1" spacing between shapes), place the entire baking sheet in the fridge or freezer for 10-15 minutes. Bake (well chilled cookies) in a pre-heated 350*F oven for 9-11 minutes. The cookies should be just beginning to have a bit of golden brown on the edges and not appear moist in the center, but still be mostly quite light in color. Cool on baking sheet about 1 minute, then move to a wire cooling rack. Enjoy cookies as is, or decorate as desired with royal icing, chocolate, etc. If you're new to making cookies, you can see step by step photos on rolling out the dough in my Sugar Cookie Recipe post. 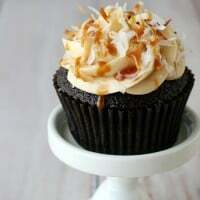 Samoa Cupcakes – Chocolate cupcakes topped with salted caramel buttercream and toasted coconut, needless to say, these are incredible! Almond Joy Krispie Treats – Delicious homemade rice krispie treats inspired by Almond Joy candy bars… chewy, crispy and delicious! Coconut Macaroons – These gorgeous macaroons look just like they came from a high end bakery, but they’re surprisingly easy to make! Oh my gosh! Schooch over, Glory! I’ll take a handful of these (or 2 or 3)! Yummmmm! ! ! You just made my day! Can’t wait to try them! 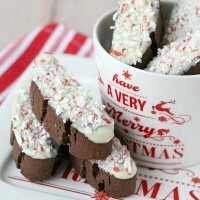 These cookies look so easy and delicious! 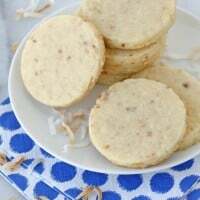 What a great idea to add coconut to sugar cookies! Oh my gosh. Ever since I discovered Trader Joe’s toasted coconut cookie thins I have been obsessed with toasted coconut in everything. I need these. Another coconut lover here I adore cookies, so hey, perfect! 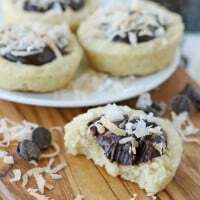 My husband loves coconut can I make these with Splenda? Yum! These sound delicious! Maybe I’ll make some for my MIL because she loves coconut. Love you! If I use unsweetened coconut would I need to increase the sugar? Not that I am trying to criticize, but the ‘ ‘ enclosed word I am pretty sure is supposed to be may not make. For my school I had to find something wrong with a website and tell them about it, so your the person. Also I made these and they are delicious!